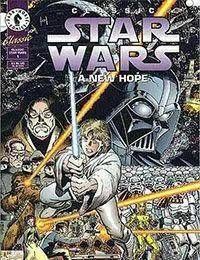 Reprinted from the original Marvel Star Wars series, this is the first of two newly colored, prestige-format issues adapting the first Star Wars movie. When this comic was first published in 1977, it caused a real clamor. Now, once again thrill to the adventures of Luke and Leia, the swashbuckling Han Solo and his trusted companion Chewbacca, the dastardly Darth Vader, and the faithful droids Artoo-Detoo and See-Threepio -- just like those childhood memories you had when you stood in line for two hours to see the movie for the first time! Pamela Rambo adds her coloring mastery to provide a magnificent updated look to the art, and Legends Art Adams adds a brand-new jam-packed cover!